Today (15 march 2017) is the most exciting day because it has been announced that XOX Mobile and Universal Music Malaysia, the local arm of Universal Music Group (UMG), the world leader music-based entertainment , have become partnership to deliver innovative digital music content as part of XOX Mobile's focus to reward their loyal subscribers. The launching of partnership is held at Blue Concourse, Sunway Pyramid at 4pm. The event setup is so pretty and amazing. Registration starts at 3pm, goodies bag is given to each participants who have registered. Everyone is ready with their big cameras to start awaiting for the artists to arrive. Universal Music Group for Malaysia and Singapore's Managing Director, Mr. Kenny Ong is giving his speech on stage during the launching. 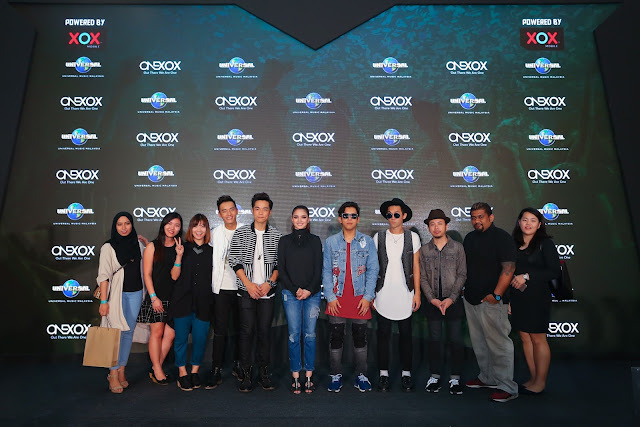 He claims that he is much honored that Universal Music Malaysia can be collaborated with XOX Mobile Malaysia. He has then highlighted that many benefits of ONEMUSIC Edition Starter Pack, which comes with special offers on concert and showcase tickets organized by Universal Music Malaysia. There are also some attractive good deals on their products at selected CD-Raman outlets and Lazada. For subscribers, there will be organizing artist workshops and flyaways where users have the chances to meet their favorite artists. Users are also having the first priority to receive exclusive events update, upcoming concerts and pre-release purchases. Lastly, we are so excited to take group photo with all the artists on the stage. I am looking forward for more surprises will be presented by XOX Mobile and Universal Music Malaysia.